Crema di Montepulciano — I had to google this. Naturally I didn’t have any, so as suggested in the recipe I made a reduction of 2 glasses of red wine and 2 tbs honey. I would use a little less honey and reduce it less next time. Trim, clean and slice the leek, and saute gently in a little olive oil. Add a little stock as it softens; don’t let it brown. When the stock has reduced to almost nothing, stir in the rice. Add the wine and reduce. Cook as normal for a risotto, stirring in the stock about a ladleful at a time and wating for each lot to be absorbed. Meanwhile put honey and red wine in a pan and reduce rapidly to a syrupy consistency. When the risotto is ready, stir in a small amount of grated Parmesan or Asiago. Ladle the risotto into bowls and drizzle with the reduced wine. Serve immediately. I almost never use butter. I usually use creme fraiche or cheese. Soon I publish one of the best risotto: risotto with pears and gorgonzola. 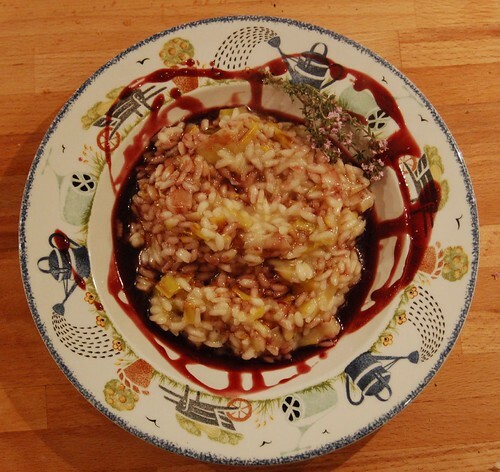 Maybe it isn’t healthy but with risotto with melone one of my favourites. oooh! I’ve had pizza with pear and gorgonzola (in Italy) but risotto … wow! And risotto with melon sounds intriguing too. 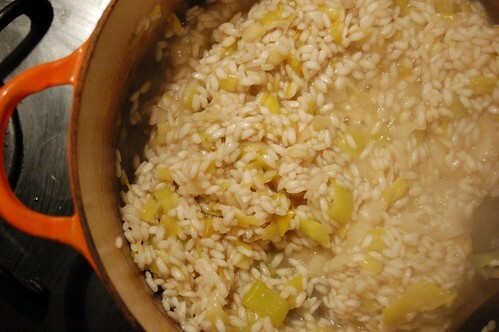 I’ve just posted the recipe of Risotto with Melon.